Based in one of the most beautiful and peaceful parts of Kerry at Gortnakilla in Clonkeen near Killarney Florish provide alternative therapies in Ireland and are an Irish manufacturer of natural cosmetics. Soon to be featured on RTE's Nationwide program. Geraldine Woessner. was born and grew up in Dublin. She has done various courses at the Dublin Buddhist Centre and studied all three levels of Reiki up to the mastership. Flourish run one day and two day Reiki courses and also offer weekend meditation courses. Flourish Organic Cosmetics & Organic Skincare are handmade in Killarney Co. Kerry with organic ingredients. Their range of organic Face Creams and Organic Skincare is a luxurious treat to pamper your senses. Flourish are proud to provide Organic Skincare made in Ireland at affordable prices. Conor Buckley Limerick wedding photographer. Is one of the few Munster based wedding photographers that will show prices on his site so you know what you are getting in advance. Check Conor's site for his portfolio and more information on the extensive wedding photography services he offers in Limerick and Munster. Based in the heart of Limerick City Conor is also a telented Graphic designer and can offer a complete package for your wedding photographs including a 40 page 30cmX40cm or 30cmX30cm Graphi photo book with hard back premium Italian cowhide cover printed on heavy weight paper among many other options to ensure that the record of your day is both memorable and long lasting. Images are also available at full resolution on DVD. Unlike many wedding photographers Conor ensures that all images of your wedding day are given to you and not just a select few with additional charges for the rest. Limerick Celtic SOFC have just topped off their amazingly successful season with a win in Dublin recently to give them the title of league champions. The club celebrated its successful double winning season with a joint bash with the Special Olympics Limerick fundraising team at Punches Hotel recently. www.limerickcelticsofc.com to catch up on the team news and to see galleries of their victory's! or you will find the link on the main web page. Scott Mays Daredevil Stunt Show Image Gallery for lots more. An amazing show non stop action. No delays as stunts followed one another in a well executed show. After the dissapointment of the "Hot Chix and Gear Stix" show in Clonshire last week Everyone was in agreement that this was the real deal, a proper stunt show. Call it the luck of the Irish but the organisers of the BBQ at Limericks Parkway Shopping Centre managed to dodge the clouds and the day stayed dry which led to a great turnout. The organisers had done a great job in ensuring that there was plenty to do and unit holders also helped with BBQ special offers in many of the shops in the centre. With Mimes, stilt walkers, face panting and Jugglers moving among the crowds everyone enjoyed the atmosphere on a lovely if overcast warm day. Situated in the town centre Ard Na Laoi is a perfect base for your visit to one of Ireland’s most picturesque regions. 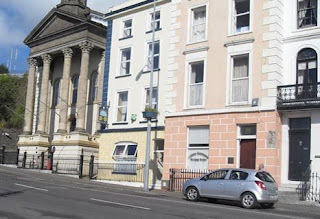 Overlooking the harbour, and within walking distance of Cobh Heritage Centre, Sirius Arts Centre, St. Coleman's Cathedral, tourist office, the promenade, Cobh railway station and a ten minute drive to Fota Wildlife Park. It is also recommended by travel writer Rick Steeves in his guide for Ireland. This top class Bed and Breakfast in Cobh has two triple and three double rooms, all of which are ensuite with TV. A spacious guest lounge with tea/coffee facilities is also available overlooking the harbour. Cobh ascends from the sea and splendidly dominates Cork Harbour one of the largest natural harbours in the world. This colourful town has experienced invasion, emigration, transportation and a wealth of maritime adventure. Other activities including golf, tennis, riding and walks are all available nearby. Cobh has its own dedicated Arts venue and holds several festivals and events throughout the year. So if your destination is the Cork region and you are looking for a central base for your visit the Cobh and the Ardnalaoi B&B should be top of you list. Visit – www.ardnalaoi.ie for more information. Skylift Hire - Local Access equipment Hire Company bucks the downturn. Skylift Ireland who provide cherry picker, boom lift and access platform hir e services from their depots in Dublin Limerick and Cork are managing to increase their business by the use of the Internet. The company’s website [ http://www.skylift.ie/ ] is getting a huge volume of traffic with thousands of hits a month and the company’s Director and founder John Cusack says that now the major portion of the remaining construction business is coming from the Web. John puts this down to the closure of a lot of the smaller local hire companies and also Skylift’s excellent level of contact with their suppliers like JCB, Skyjack, JLG and Genie. Skylift Dublin has just moved to a new flagship 10,479sq foot new depot in Rathcoole and will be continuing to expand Skylift’s already extensive customer base in the region. Parkway all this week to help promote the BBQ Cookoff on Sat 20th June. Starting at 12pm till 5pm to Celebrate their 25th Birthday. Below is from the Parkway web page. "The celebration will include live music, jugglers, stilt walkers and lots more fabulous entertainment for all the family. Plus you will be able to taste the complementary food from competing BBQ teams. There will be entertainment both outside in the BBQ area and also inside the shopping centre. It doesn’t stop there; there will be Parkway branded promotional teams offering BBQ revelers and shoppers the chance to win ‘Top 25 Gifts’ from Parkway retailers. To enter, simply give your details to the branded promotional teams at the BBQ – you will receive a printed coupon which you will need to place in the entry box in the shopping centre. Plus you will also get an extra chance to enter - with every purchase made in any of the Parkway Shopping Centre stores you will receive an entry form to complete and place in the entry box in the centre! To enter a team in the BBQ competition, simply register to take part by downloading the entry form from the link below. All completed forms can be dropped into Parkway Shopping Centre Management or alternatively they can be emailed to bbq@parkwayshoppingcentre.com. For any further enquiries please contact Centre Management on 061 - 416144 "
Pictured is Anne Bowen Cooking Declan up a quick snack to tide him over during the show. Hope this makes up for the the non running of the International BBQ competition at Riverfest this year and it does sound as if the Parkway management are putting in a lot of effort to making the event a success. I will be there taking a few snaps so stay tuned for more info..
on May 20th see below from http://www.scottmaydaredevil.co.uk/ I figured somthing must be up as this was not up to what I had seen on the website and also not all of what they said as going to happen on the night did. I will go to the real deal later this month. WORLDS BIGGEST TOURING STUNT SHOW APPALLED BY IMITATION OUTFIT! Stunts UK Ltd presents, Scott May's Daredevil Stunt Show, the worlds largest of its kind. Due to the success of the touring show in Scotland, England and Wales the team are embarking on their first tour of Ireland, having been invited over by the Irish Greyhound Board, several racecourses and raceways. Scott and his team commence the Irish leg of their Daredevil Tour on Friday 12th June until Sunday 21st June 2009, performing at 10 different venues. Members of the publicity team are already in Ireland and they have experienced threatening behaviour from a smaller imitation stunt show. Unbelievably, they have photocopied the official Scott May's Daredevil Show posters, removed "Scott May" from the top of the poster and placed their tour dates at the bottom, making it almost impossible to distinguish between the two shows, in an attempt to dupe the public into thinking they will be attending one of Scott May's shows. They have also placed cancelled stickers over the Scott May posters. DO NOT TRUST POSTERS STATING THAT THE DATE AND/OR VENUE OF OUR SHOW HAS BEEN CHANGED! Company Director and founder of the show, Scott May, is disgusted at the behaviour and attitude of this imitation group, he said, "I cannot believe the extent to which this group have gone, they could ruin the reputation of the show that I have established over the last 19 years." Cornishman Scott continued, "I have even been contacted by venue owners and radio stations asking if I have cancelled my shows. A person, pretending to be my show agent has been spreading malicious words that my shows have been cancelled. I can categorically state that none of our shows have been cancelled and to save disappointment I ask that members of public who wish to see the World's number 1 touring stunt show to visit our website (www.scottmaydaredevil.co.uk) to find out more information regarding the show." The official tour will be performing shows in Wexford, Kilkenny, Dublin, Kilbeggan, Dundalk, Naas, Waterford, Rosegreen, Limerick and Cork. The copycat show appears to be travelling around Enniscorthy, New Ross and possibly moving onto Tipperary or Cork. Members of the public are advised that if they do attend the imitation show that it is not part of Scott May's Daredevil Stunt show and that they may be disappointed. It may not contain the stunts that are advertised on our official posters. Additionally, venue owners should be advised that this copycat company maybe using the good name of Scott May, in order to acquire the venues for their tour. This tactic has already been identified at several venues in the South East region of Ireland. Scott May's show is an action packed one and a half hours of thrills including car crushing monster truck destruction, human cannonball, motorcycle, car and fire stunts, incredible two wheel driving displays using a quad, buggy, car, van and believe it or not, at some venues, a 7.5 ton lorry driven on two wheels. Those spectators daring enough to ride in one of the show's mega monster machines have the chance to win a ride in Europe's only ride on monster truck. The truck aptly named 'Slaine' has 10 seats in the back to thrill the lucky winners who dare to enter the competition. As well as a ride on monster truck there is a second monster truck, "The Bandit" and an adapted tracked vehicle "Thunder Trax", which both cause massive destruction. Other exciting features of the show involve fire, pyrotechnics and the infamous Sumpy the stunt clown. Sumpy, as always will be bouncing into things and causing trouble where-ever he decides to get involved…. Tickets are only available on the gate on a first come first served basis so get there early to avoid disappointment! Click --> Munster Images for the full gallery.